Yeah, I know the banner up top says "1960-1990." But the sad truth is that rules were made to be broken, that time marches on, and that 1995 and even 2005 are getting further away all the time. In that spirit I present my 2005 Anime Jump review of a DVD set of a 1995 television series starring five good-looking young people from all walks of life who team up, don primary-colored outfits, and battle evil with their super Sailor powers! Pity poor Sailor Moon. Too old to be watched like a regular show, too young to be remembered with nostalgia, not quite silly enough to be enjoyed as camp. It's sad, really. Sailor Moon once proudly bridged the gap between the cutey-pie magical girls shows watched by 10-year old girls and the five-color fighting team series enjoyed by their younger brothers, with enough style to attract the 12-and-overs and enough cheesecake to keep dads and lads riveted. As a Japanese comic and cartoon it was a bona fide phenomenon, and as an import it is THE series that broke the gender barrier and made it once again okay for girls to watch cartoons and read comic books. Especially comic books. The impact of manga on the American bookstore market is phenomenal, and it is driven by comics that are read by girls, and the one that started it all was Sailor Moon. But enough philosophizin'. This is a review of Sailor Moon SuperS, not a freakin' thesis statement. And I'll be blunt. If you already know and like Naoko Takeuchi's Sailor Moon, you'll probably like Sailor Moon SuperS (or "Super S" as it's sometimes known as). All the ingredients you've come to expect are there: mysterious enemies from beyond the portal of time, sexually ambiguous characterizations, yet another fashion makeover for Sailor Moon, a few subplots involving dates and important life decisions for secondary characters, and at least one third of every episode occupied by your various transformations, magical weapon attacks, pleas for help from mysterious otherworldly beings, statements of intent on the part of the Sailor Scouts, and the et cetera. If, on the other hand, you have never seen Sailor Moon, you will find yourself getting bogged down with such basic questions as Who Are These Girls and Why Do They Have These Powers, before moving on to more advanced questions like Why Do The Mysterious Extradimensional Invaders Always Pick Sailor Moon's Neighborhood To Spearhead Their Invasion, and How Old Is Chibi Moon Supposed To Be Anyway. This show's got no time for explanations. 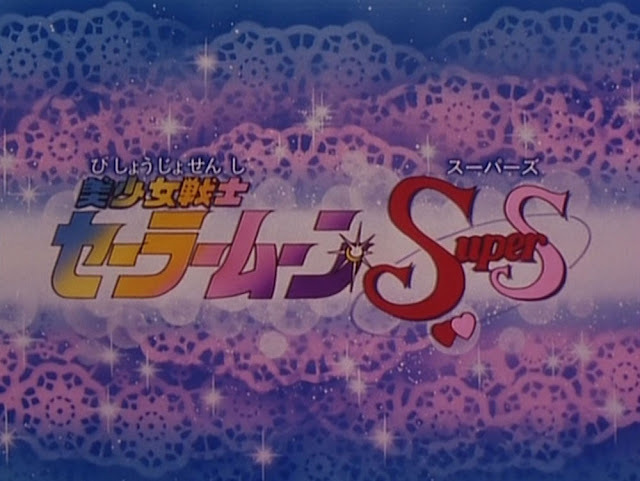 Originally a TV Asahi broadcast from March 1995 until March of the next year, SuperS was the fourth Sailor Moon television series from Toei and the third to be directed by Maple Town veteran Kunihiko Ikuhara. America got the show in 2000 as part of Cartoon Network's Toonami, a DVD and VHS release from Pioneer/Geneon later in the decade, and more recently, Viz re-licensed the series for an updated release later this year (2018). 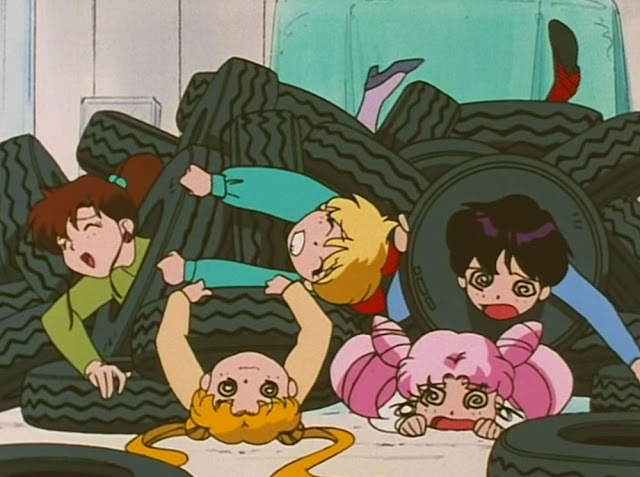 The gist of SuperS is that a mysterious circus-themed universe of evil is erupting forth into the pastel-colored Tokyo of Sailor Moon and her teenaged chums. Commanded by the Yoda-esque Zirconia, the fighters of Universe Ringling are methodically abducting people from all walks of life in order to steal their dreams! No, not take away their student loans or their publishing deal, but actually stealing the actual dreams themselves. It's all because Queen Nehelenia, the leader of this acrobat-and-clown infested dimension, seeks a magical crystal that can restore her to her rightful place as the absolute ruler of all creation. This crystal is held for safe keeping by, naturally, a Pegasus, and this Pegasus is hiding out inside somebody's dreams. And THAT somebody with the flying horse dreams is Chibi-Moon, Sailor Moon's annoying daughter from the future who was sent to the past because childcare in the future is very expensive. 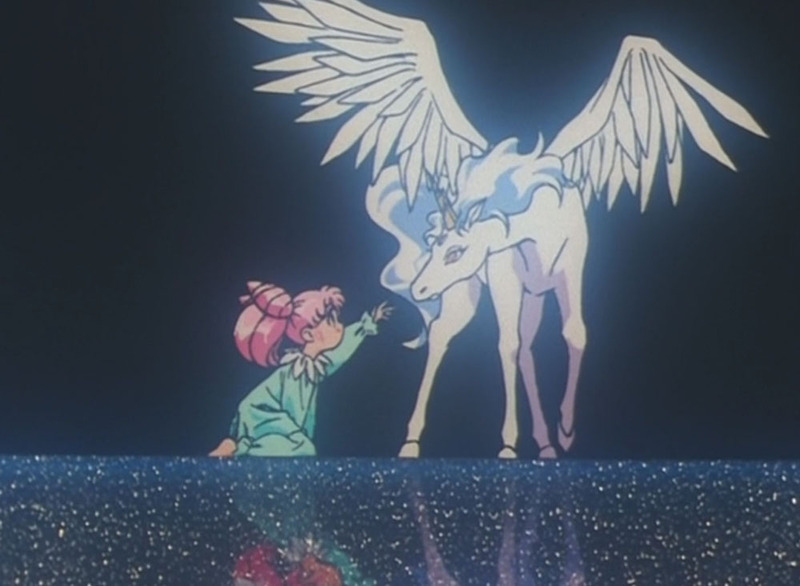 Finding out she's got a Pegasus living inside her dreams works out well for Chibi-Moon. She's got somebody to talk to when things get lonely, and what's more, when battles frequently erupt between Sailor Moon and the varied minions of Planet Big Top, the Pegasus clip-clops into our world and destroys the villian with one wave-motion blast from his magical unicorn horn. So that's convenient. Sailor Moon is not a show that really responds well to critical examination, because that's not what it's about. 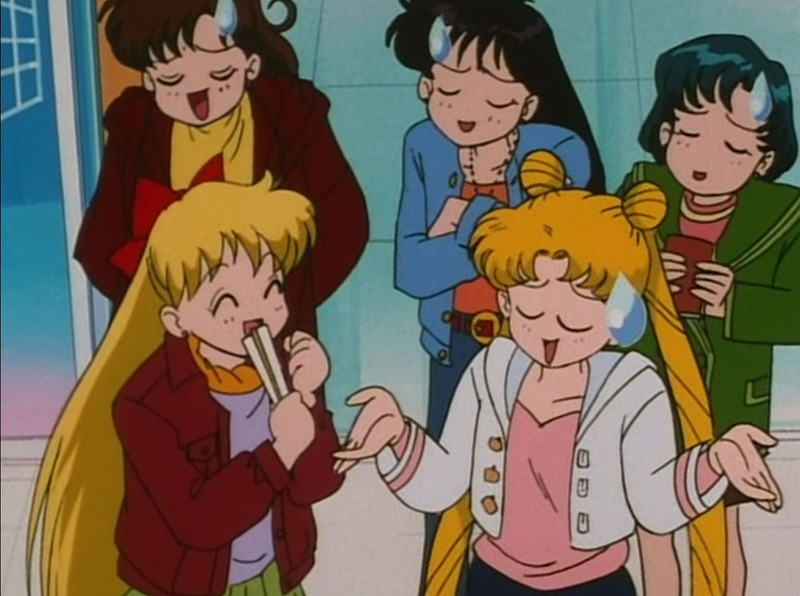 Nobody cares whether or not any of this stuff makes sense; the important thing is that Sailor Moon and her friends and her friends' friends are friends for life and even though they feud with each other they're still friends, because friends should be friendly. 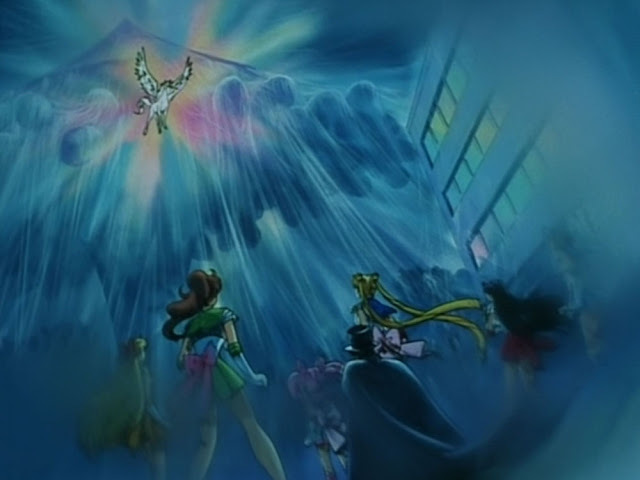 Even the villains become friendly; they're monsters because they've been mistreated, because they've never known real friendship, and once they realize that these Earth creatures are willing to be their friends, they quit being villains, and the head villain has to destroy them, and that makes Sailor Moon mad, and several magical power weapon attacks later the Earth is saved so that everybody can be friends. This is the kind of show that pre-teens watch once a week or once a day and think is terrific- even adults can watch the occasional episode and marvel at the spiffy animated sequences and the long, flashing, mini-skirted limbs of the heroines. But watch more than one episode in a row and you'll notice a third of every episode is taken up with the same transformation, magical beam, whatever sequences. In a 22 minute show that means that - do the math with me - 7 minutes and 20 seconds of a typical Sailor Moon SuperS episode is stuff you saw in the last episode, and in the episode before that, and the episode before that, etc. big or small, they all fall when this girl hits them like a cannonball! Now this is a kids show, and kids eat this stuff up. Part of the appeal is knowing that Sailor Moon has a ritual, and kids love seeing the cool transformation sequences in the same way they like always having the crusts cut off their sandwiches. Adults, on the other hand, find themselves going to the kitchen for another drink. Sure, there are several episodes that stand out. One episode, dealing with the candy monster that gives all the neighborhood kids tooth decay, is exceptionally funny and has a scary dentist, to boot. As it happens Queen Nehelenia goes through about seven different henchvillians and even Zirconia his- (or her, depending on which language you view the show in)-self is betrayed. Pegasus turns out to be a cute boy with a little unicorn horn, and Sailors Mars, Venus, Jupiter, Mercury, and Moon use their magical force beams to blast Nehelenia back to where she came from, probably winter quarters in Sarasota. Sailor Moon SuperS is the, let's see, fourth different Sailor Moon TV series, and the last to be translated in its entirety into English for the North American market. The Toronto-based dubbing is lackluster; stiff, unconvincing, and casual with the genders of some of the characters (though admittedly sometimes it's hard to tell with this show). Many times the dub will take a sharp left turn away from the original dialog, and usually this means annoying catch-phrases and "hip" slang that's already dated. Geneon's set - labeled "The Complete Collection", and referred to as "The Pegasus Collection" on the DVD menus - is packaged smartly with the DVDs in slimline cases that fit neatly into a cute little box. Extras include... well, there aren't many extras. You get the original Japanese openings, and Karaoke versions of the original Japanese openings and endings, and that's about it. If you're liking some Sailor Moon you'll enjoy SuperS, though I can't say how many episodes in a row you'll be able to watch before the endless stream of strangely worded magical attacks and transformation sequences become too much to bear. Out of 39 episodes there are maybe 8 that don't follow the "monster of the week" format, so the less dedicated Mooninites out there may want to skip to the good parts or simply enjoy the show in smaller quantities. But for those occasions that require a big chunk of Sailor Moon SuperS, the "Complete Collection" is a must-have. What exactly, if any, those occasions might be, is a question I leave to you.